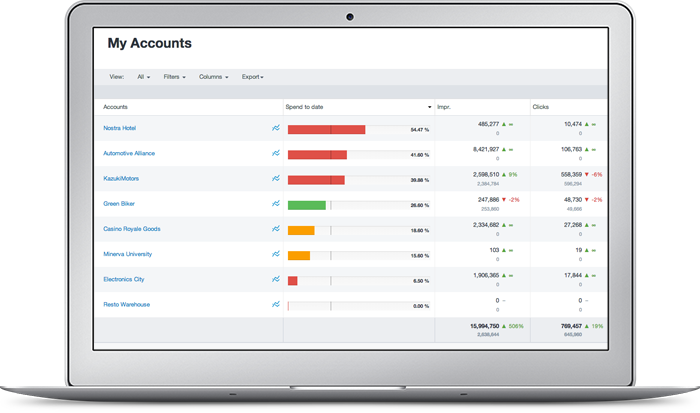 Acquisio is great if you are managing a large number of paid search campaigns. It makes it easy to keep track of everything and make bulk changes when necessary. The reports are exceptional at providing a comprehensive view of the data and are extremely easy to create. If you need to create a custom ad hoc report, it can be done in as little as one minute. You can then schedule the reports to be emailed to yourself or someone else on a recurring basis. Kenshoo Search may not be appropriate if you don't spend much on search engine marketing. It also may not be appropriate if you don't care about tracking conversions and are only concerned with increasing awareness. Or, if you care about tracking conversions but don't expect to capture many, Kenshoo Search may not be necessary. Automated Rules: Acquisio allows the use and creation of rule based automation to perform tasks based on what you've outlined. KPI's: Within the platform, there is the ability to track spend or other important KPI's throughout the month and see the on-track progress being made. Reporting: The reporting system allows for automated reporting, so an account specialist does not have to spend time every reporting period recreating the same report. The flexibility of date ranges and data points is very helpful in building data driven reporting. The data is very often wrong. The data is slow to update. They often experience technical issues, which makes us never want to use their internal tracking system. Layout not as clear as traditional engines. DoubleClick offers easier integration with [search] engines. The price restraints makes other platforms out of reach. Not quite as seamless as Marin whose editing tool seemed better but also not as expensive and fit better into our agency's budget. Acquisio let us create reports on the fly, saving us lots of time; time that was better spend optimizing client campaigns. Acqusio's Bid and Budget Management tool (BBM) helped a struggling client achieve desired traffic and conversion results with little to no work from our agency. Acquisio's quick customer service responsiveness let us get our questions answered quickly.